Welcome to Lisbon, Portugal’s enchanting capital. 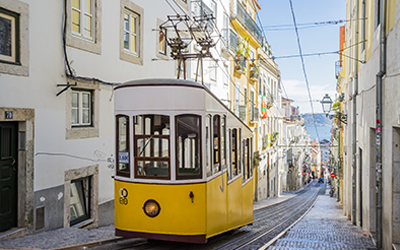 Get settled in your carefully selected accommodation and prepare to be dazzled by Lisbon’s alluring mix of quaint charms and contemporary vibe. First, you’ll discove Castelo de São Jorge the Moorish castle that overlooks the city’s historic center and Tagus River. Wrapped around the castle’s slopes you’ll find the Alfama, Lisbon’s oldest and most atmospheric neighborhood– walk around its winding alleys an take in the traditional Portuguese street life. Next you’ll be off to the Museu Gulbenkian, a fascinating museum that holds an amazingly diverse collection of artifacts. 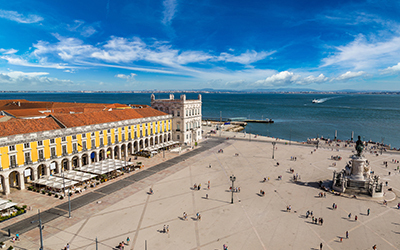 During your stay in Lisbon you’ll also visit Belém, a district with significant maritime history and home to the Belém Tower as well as the sublime Mosteiro dos Jerónimos, a monastery built to celebrate the achievements of the great Portuguese explorers. Furthermore, Lisbon serves as a great starting point for a day trip to the UNESCO heritage site of Sintra, a summer retreat for Portugal’s royals – their lavish and extravagant palaces still standing and waiting to be explored! 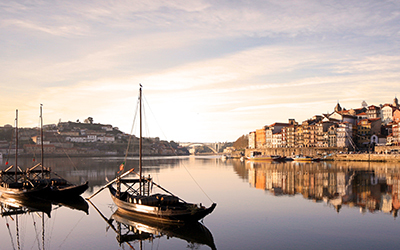 The first stop on your True Antiquity travel experience is Porto - Portugal’s second largest city and commercial center. Make yourself comfortable in your TrueTrips luxury hotel and set off to discover everything that the city has to offer! Your private tour guide will uncover the secrets of the World Heritage proclaimed old town with its impressive buildings, quaint winding alleys, and imposing Romanesque Cathedral. During your stay you’ll get the chance visit the Fundação Serralves and the Museu Nacional Soares dos Reis, Porto’s two most significant museums. Apart from its rich history, Porto also boasts a buzzing nightlife and a promising culinary scene so don’t miss the opportunity to enjoy an authentic Portuguese meal at one of the city’s charming restaurants. Of course no visit to Porto would be complete without a port wine tasting; so follow your guide to Vila Nova de Gaia, and indulge in a private wine tasting and tour of a traditional port cellar. Welcome to Coimbra - the ‘university city’ of Portugal that cascades down to the banks of the Mondego River. 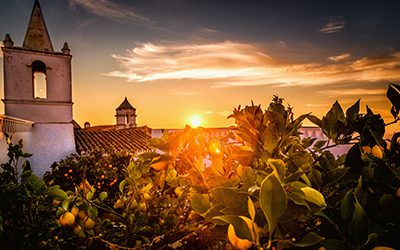 Set out to discover Portugal’s oldest university founded in 1290 with its awe-inspiring Baroque library and 18th century clock tower. Next visit Conimbriga, one of the largest and best-preserved Roman settlements in Portugal; adjacent to the archaeological site you’ll find a museum exclusively dedicated to the archaeological findings of Conímbriga. The Alianca Underground Museum is also a point of great interest; it is a museum housed in 50 year-old wine cellars and holds an excellent collection of 18th-century Portuguese ceramics, African artwork, fossils, semi-precious stones, and various archaeological artifacts. 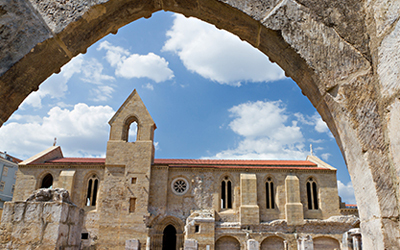 Coimbra is an atmospheric, colorful and lively city that you will surely enjoy. Welcome back to Lisbon for your final stay on your True Antiquity Portugal holiday! Having already explored most of the city’s important sights during your previous stay, take some time to relax and get better acquainted with local Portuguese life. Head to the area of Baixa to find some of the most interesting shops and cafes in Lisbon, and then climb up the Avenida da Liberdade until you’ve reached the beautiful Eduardo VII Park. In the evening visit the lively Bairro Alto to find some of Lisbon’s best bars and fado clubs. To conclude your True Antiquity Portugal holiday, your True Trips travel expert has planned a lovely dinner at one of Lisbon’s finest restaurants!